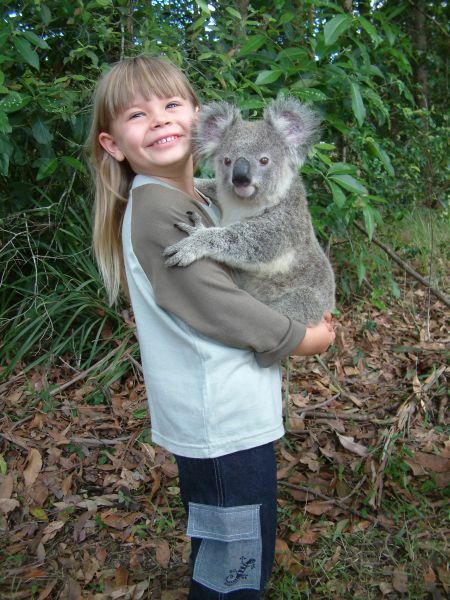 Bindi with a big smile holding a Koala. Prettie : D ! your a very lucky girl to have such a great dad . i have always wanted to go to his zoo . and check out all the crazy stuff he doess, well anywayss stay strong . and be happy . ii love you bindi ! You are a brave soul, and I admire you greatly. I was a fan of your fathers since I was little. He was an amazing human being. We need more people like him in this world. You were very lucky to have him as a father. God bless you and your family. You're very lucky to have a dad like steve, i never had a dad growing up, all my love to you and all your family!! Very nice pic of you and the Koala...he's very adorable. Your dads spirit lives on in you and i know that you will do him so very proud with all that you do in your life. I'm so sorry to hear about your dad; i know that it has been a while, but i just fount this site, and so i thought that i would comment you to tell you that you are a very beautiful girl, and you are very brave. I would do anything just to be like you. You are my role model. Me and my family feel so sorry for you and your family. How are you getting on 'Special Girl'. I lost my mum recently too so i no how it feels to have lost someone special that you love very much. so you take care sweety !!! just remember we all loved your dad. AND STILL DO. We love you Bindi. I think about you and your whole family everyday. You are pretty little girl. We all miss you dad heaps. You are all in our thoughts everyday. I love that koala its so cute. Stay strong bindi. You have people all over the world thinking about you! The world loves you. And thank you Scott for saying that ii was getting tired of seeing that stuff 2!! Such a strong soul, with a bright future continuing Steve's endless work. To the person who posted the rubbish, you are pathetic!! This certainly isn't the site to post your filth. To grow up with all the animals of the world is very special for a little girl, but it's heartbreaking to know that she lost her father on the age of 8. Keep up girl, we will never forget him. Bindi i think u r soooooo brave and you have soo many fans just like ur father!! He was a great man, he was my hero!! I was there at the memorial and it touched me to see you get up on stage and read about your father!! All my love to you, your mother, brother, and all ur family! !